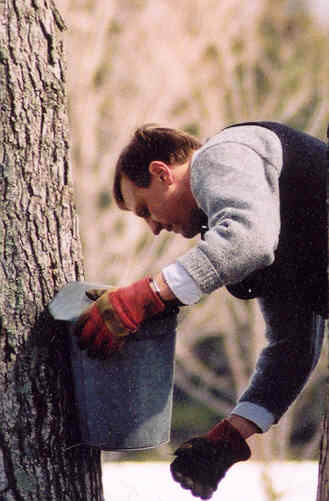 Since 1840, Arnold Coombs and his family have been committed to making simply the finest, pure New England maple. In fact, it’s been a way of life for seventh generation farmer Arnold Coombs practically since the day he was born. On the way home from the hospital, his mother stopped in so newborn Arnold could meet his father, Robert Jr., who was busy sugaring during peak maple season. At the age of three, Arnold started riding behind the tractor while his dad and granddad, Robert Sr., tapped trees. As a shy ten year-old, he came out of his shell giving maple tours to out-of-towners. As a teen, he remembers summer after summer pouring hot maple into candy molds alongside his grandmother. Now, Arnold is teaching his own boys, Max and Addison, what was passed down to him. Today, as General Manager of Brown Family Farm, Arnold and his team continue to turn pure maple into the most authentic, fresh and pure maple culinary delights you’ll ever taste. In addition to running Brown Family Farms, Arnold is the general manager of Brown Family Farm’s parent companies, Coombs Family Farms and Bascom Family Farms. Arnold is a champion for small family farms and advocate for the maple industry. He currently serves as the chairman of the Vermont Maple Industry Council, is a member and past director of the Vermont Maple Sugar Makers Association, and a member of the Organic Trade Association. Arnold graduated from Champlain College with a degree in Business.